As I’ve pushed back against that fear, I’ve learned something invaluable. We create in cycles. I love to garden, to play with flowers and to read. These are regenerating escapes that I savor – and use to clear my mind and center myself. There's something about digging in the earth that grounds me. I just planted five Café au Lait Dahlia tubers yesterday; I love how ugly they are when you bury them in the dirt. If you haven't seen a dahlia tuber, just imagine an extra knobby brown potato, with a lot of awkward white roots sticking out of the bottom, and brown wart-like knots near the top, which are called the tuber's 'eyes'. You are burying hope every time you plant a tuber, or a seed. There is so much power in these utilitarian compact beings, and when you tuck them into their dark beds, the magic starts to happen. The mystery of the deep soil, warmth from the sun, and damp from the rain activates the explosive power within those small unassuming bodies – tiny green leaves begin to surface, stretch and grow. Every time I see a new leaf or blossom, I marvel at the journey that has all taken place underground, beyond our comprehension. The analogies to a Creative's life, art and work roll over me as I make new discoveries in my garden every season. The beautiful flowers, the crowning glory of that tiny seed, follow the sun and receive all the praise. And they fade so quickly! We have poppies blooming right now, and the tiny bud unfurls in the early dawn, wrinkled and shaky, shines and dances for a day, and then loses all its petals as the dusk approaches. She's gone by the next morning. One day of glory. But the pollen she offered to the bees for her day in the sun, and the seeds she will shed from her drying body – those gifts echo and ensure her return, in a new form, next spring. It's such a gift to get to dig in the dirt, and play a small role in the lives of flowers. I'm a wife, and a Momma to two little girls, so when I actually have the time to create, it feels like an absolute luxury. I think because the time to create is so precious, and I wait for it all day, I dive in whenever I can, in whatever capacity is needed of me. In the morning and afternoon. By evenings, all I have energy for is digging the garden with my family. And perhaps a hot bath by myself, with lots of glowing candles and a large glass of red wine. But nothing is set in stone, and I've learned to move to the creative cycle. If the Muse appears at 11pm, please believe I will be switching my lamp on and painting the thoughts in my mind. Textiles would be incredible. Sustainable garments with beautiful fibers. I would love to teach and travel; an image just came to me of sitting in a garden setting, painting 'en plein air,' with a group of students, enjoying a lovely picnic while creating together. What a dream. I am working on my first book! It's going to be a modern watercolor book, teaching the basics of my technique, but also exploring dynamic ways to incorporate ink and gouache into your creative process. It will be out in 2019, and I couldn't be more honored to be creating this right now. Being approached by an incredible publisher, and sharing my joy in painting is beyond my wildest dreams. Also, as I’ve pushed back against that fear, I’ve learned something invaluable. We create in cycles. If Fear wins one day, try to paint again the next day. Do something to help break the slump in creativity; exercise, garden, speak to an encouraging friend that believes in you and your talent. I also read books to break up my self-doubt and fear. One of my favorites is “The War of Art” by Steven Pressfield. The author takes apart the creative cycle in small, one-page chapters, and helps you identify what’s holding you back. And once you can see the cycle, and the obstacles, it doesn’t feel as intimidating. Once you’ve rested and you try again, you’re better and stronger than you were before. If I can go to sleep at night and be thankful that I've been able to hit these marks, and ask for forgiveness where I haven't, I feel like its been a good day. I create so I can be myself. I create so I can do all other things in my life fully. I like to listen to TedTalks, and an inspirational speaker, Brené Brown, recently shared something that resonated in my life. She explains that as a society, we spend so much time doing the things we should do, or the things we have obligations to do, that we are never left with moments for ourselves to recharge, to invigorate us to feel alive. She shares, "…there is the in-breath and there is the out-breath, and it's easy to believe that we must exhale all the time, without ever inhaling. But the inhale is absolutely essential if you want to continue to exhale." Creating is absolutely necessary in our every day lives. 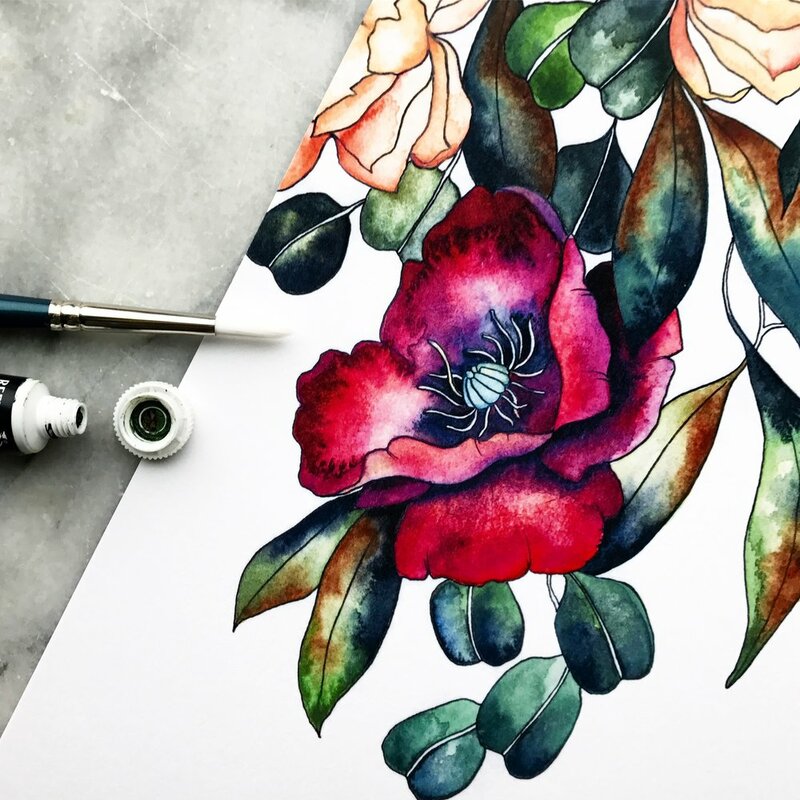 To see more of Sarah's incredible work head to www.themintgardener.com and to follow along with her creative journey check out her Instagram @themintgardener.